The most wonderful thing in my mind for a holiday is that which brings friends and family. The most unexpected one that always brings friends and family to my house is St. Paddy's Day since the typical family holidays like Easter bring us elsewhere. As a person who is Irish through and through, and American, I can't help but love corned beef. I know from an anthropological nutritionist (yes, they do exist!) that New York is the mecca for corned beef. 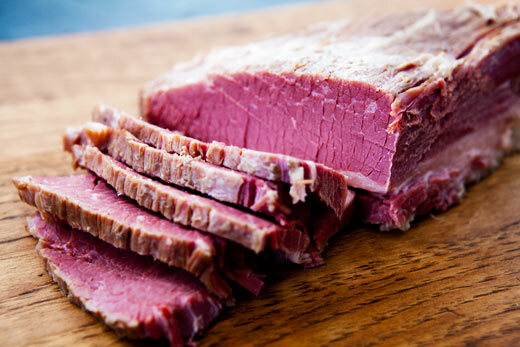 Basically the Irish immigrants came here to the states, landing in New York and chose to adopt the corned beef from their Jewish neighbors who were making it as an inexpensive cut. This somewhat compared to Irish's missed bacon from home so off it went. Now, what I'm told, is that corned beef would be far too expensive to have developed with the masses as a popular main stay in Ireland with both beef and salt being grossly expensive. So yes, for the most part, I believe it was adopted here ... and I do know that the Irish love beef, but very cooked, and it's a treat as an expensive cut from back home. Leave it to the melding of cultures to produce something sooooooo nummy. That's why I feel so blessed to be livin' in America! I have adapted several recipes to make what I think is one of the most wonderful corned beef recipes, mostly adapted from Alton Brown and my local supermarkets. Keep in mind you'll want to have between a half pound to full pound per person on St Paddy's Day, or for whatever day you serve this meal! Place the water into a large 6 to 8 quart stockpot along with salt, sugar, curing salt/saltpeter, pickling spice (or cinnamon stick, mustard seeds, peppercorns, cloves, allspice, juniper berries, bay leaves), ginger, thyme, mustard powder, and garlic slices. Cook over high heat until the salt and sugar have dissolved. Remove from the heat and add the ice. Stir until the ice has melted. If necessary, place the brine into the refrigerator until it reaches a temperature of 45 degrees F. Once it has cooled, place the brisket in a large plastic container or large freezer bag and add the brine. Seal and lay flat inside a container if using a bag, cover and place in the refrigerator for 7 - 10 days. Check daily to make sure the beef is completely submerged and stir the brine, flipping the meat every other day or every day. I will follow up with a great way to cook the corned beef, but then again tons of sources out there!